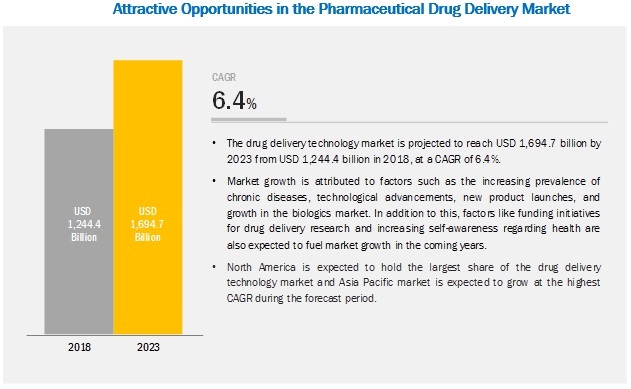 [289 Pages Report] The global pharmaceutical drug delivery market is projected to reach USD 1,694.7 billion by 2023 from USD 1,244.4 billion in 2018, at a CAGR of 6.4% during the forecast period. Growth in this market is mainly driven by the rising prevalence of chronic diseases, growth in the biologics market, and technological advancements and new product launches. The topical drug delivery market is expected to grow at the highest CAGR during the forecast period. Based on route of administration, the pharmaceutical drug delivery market is segmented into oral, pulmonary, injectable, ocular, nasal, topical, implantable, and transmucosal drug delivery. The topical drug delivery market is expected to grow at the highest CAGR during the forecast period. Growth in this segment can be attributed to the wide range of advantages associated with this route of administration, including convenience and ease of use, right dosage to the right place, painless and noninvasive delivery, superior spreadability, and enhanced patient compliance. Based on type, the injectable drug delivery technology market is segmented into conventional injection devices, self-injection devices, and other devices. The conventional injection devices segment accounted for the largest market share in 2018. The large share of this segment is due to the increasing prevalence of chronic diseases (particularly cancer and diabetes) and CVD, growing demand for biosimilar products, and low cost of devices and manufacturing. On the basis of facility of use, the pharmaceutical drug delivery market is segmented into hospitals, ambulatory surgical centers (ASCs)/clinics, diagnostic centers, home care settings, and other facilities of use. In 2018, the hospitals segment accounted for the largest share of the pharmaceutical drug delivery market. This can be attributed to the significant number of inpatient and outpatient visits to hospitals and the requirement of large volumes of drugs and their respective delivery devices to cater to the demand of the large patient pool. Geographically, North America accounted for the largest share of 39.8% of the market in 2018, followed by Europe. The large share of the North American market is due to factors such as growth in biologics in the pharmaceuticals market; the rising prevalence of chronic diseases such as cancer, respiratory allergies, and diabetes; increasing patient compliance to innovative drug delivery technologies; and the presence of a large number of prominent players in this region. The global pharmaceutical drug delivery market is highly fragmented owing to the presence of several large and small players. Johnson & Johnson, Inc. (US), F. Hoffman-La Roche (Switzerland), Merck & Co., Inc. (US), Bayer AG (Germany), Pfizer, Inc. (US), Novartis AG (Switzerland), 3M Company (US), Becton, Dickinson and Company (US), GlaxoSmithKline plc, (UK), Sanofi (France), and Antares Pharma, Inc. (US) are some of the leading players operating in the market. Johnson & Johnson, Inc is one of the prominent players in the pharmaceutical drug delivery market. The company offers a robust product portfolio and has a strong geographical presence in this market. The company has 125 manufacturing facilities all across the globe. J&J primarily focuses on products related to human health and well-being. Innovation is an integral part of the company. The firm is committed to improving human therapeutic medicines through continuous investment in R&D. Novartis AG is another leading player in the pharmaceutical drug delivery market. The company’s strong brand recognition and extensive product portfolio in this market are its key strengths. To maintain its leading position in the market, the company adopts organic as well as inorganic growth strategies such as acquisitions and expansions. In 2018, Johnson & Johnson, Inc signed an agreement with the Oklahoma Health Care Authority (OHCA), (US). Under this agreement, OHCA aimed to improve care among patients with schizophrenia and to cut down the expenses for medical services. The agreement is focused on enabling the use of INVEGA SUSTENNA (paliperidone palmitate) and INVEGA TRINZA (paliperidone palmitate) in the treatment of adults with schizophrenia. In 2018, Johnson & Johnson, Inc collaborated with the Jenner Institute at the University of Oxford to develop and manufacture a vaccine against Middle East Respiratory Syndrome Coronavirus (MERS-CoV). In 2018, Novartis signed an agreement with Gan & Lee (China) to commercialize and supply biosimilar versions of insulins (glargine, lispro and aspart, the three top insulin medicines by sales), used in patients with type 1 and type 2 diabetes. What are the recent trends affecting the pharmaceutical drug delivery market? What are the application areas of pharmaceutical drug delivery? What type of drug delivery technology are companies exploring? 6.2.1.1.1 Development of Mini-Tablets is A Key Trend in This Market Segment. This study involved four major activities to estimate the current size of the pharmaceutical drug delivery market. Exhaustive secondary research was carried out to collect information on the market, its peer markets, and its parent market. The next step was to validate these findings, assumptions, and sizing with industry experts across the value chain through primary research. Both top-down and bottom-up approaches were employed to estimate the complete market size. Thereafter, market breakdown and data triangulation procedures were used to estimate the market size of segments and subsegments. Secondary research was mainly used to identify and collect information for the extensive, technical, market-oriented, and commercial study of the pharmaceutical drug delivery market. Secondary sources such as the Centers for Disease Control and Prevention (CDC), World Health Organization (WHO), Health Canada, American Journal of Drug Delivery and Therapeutics, Center for Drug Delivery and Nanomedicine, Parenteral Drug Association (PDA), International Journal of Drug Delivery, Annual Reports, Press Releases, SEC Filings, and Investor Presentations were used. These sources were also used to obtain key information about major players, market classification, and segmentation according to industry trends, regional/country-level markets, market developments, and technology perspectives.